Every planner I create, whether it’s for work, family, or my personal life, starts with a monthly calendar. To me, they are the basic building blocks for which all planners grow from. I like having a place to jot down future appointments and events and having an overview of what’s going on each month so I can better plan my time. 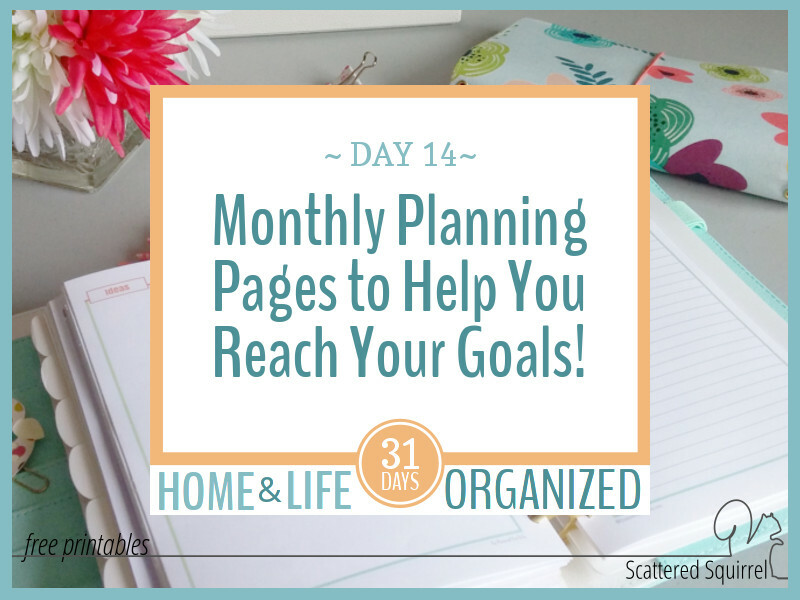 After the monthly calendars, the next pages I set up are my monthly planning pages. These give me a little extra planning room and, more importantly, give me a place to track my goals for the month. We kicked off the planner portion of this series yesterday with the blank monthly calendars. I chose to start this way because this is how I set up my planners. My next step is to add in monthly planning pages. These pages were a new addition I added to my planner last year. I tested it for a few months before sharing them in the From Scattered to Sane series, and I have to say I really love the impact they’ve had on my planning. 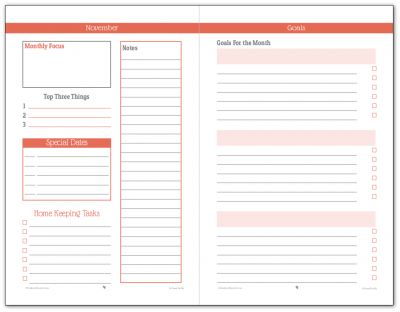 I use these pages to help me structure my months. They help me keep track of things I need to remember but may not need to schedule. Because I was trying to be more intentional about working on my goals, I also included a section for planning my goals each month, or, I’ve also used this space for yearly goals so that I don’t forget about them. Keeping time management and goal setting systems simple seems to be my personal key to making them work. The more complex a system the harder it is for me to maintain. I want to spend my time on things I want to be doing, not on upkeeping the system that is supposed to be helping me. As you can see from the printable above, I tried to keep the monthly planning pages as simple as I could. Home Keeping Tasks – which is where I record any deep cleaning, monthly or seasonal cleaning that needs to be done that month. Goals for the Month – this where I jot down not just my goals, but the steps I need to take to reach those goals. I refer to these every week during my Sunday night planning sessions. Note – because sometimes you just need some room to write stuff down. I print the monthly planning pages on the back of my half-size two-page monthly calendars, but you could easily print them out on their own. You might have noticed that the printables above don’t really match the calendars I shared yesterday. That’s because I updated the old one to match the 2017 Date Calendars. But don’t worry, I’m not going to send you link jumping to get the ones from last year. Check them out in the galleries below. I have one more version of a monthly calendar that I want to share with you tomorrow. It’s a new page that I’ve just started experimenting with and I’m excited to see what you think. Until then, I hope you enjoy these ones. I would love to hear what you think about these monthly planning pages. 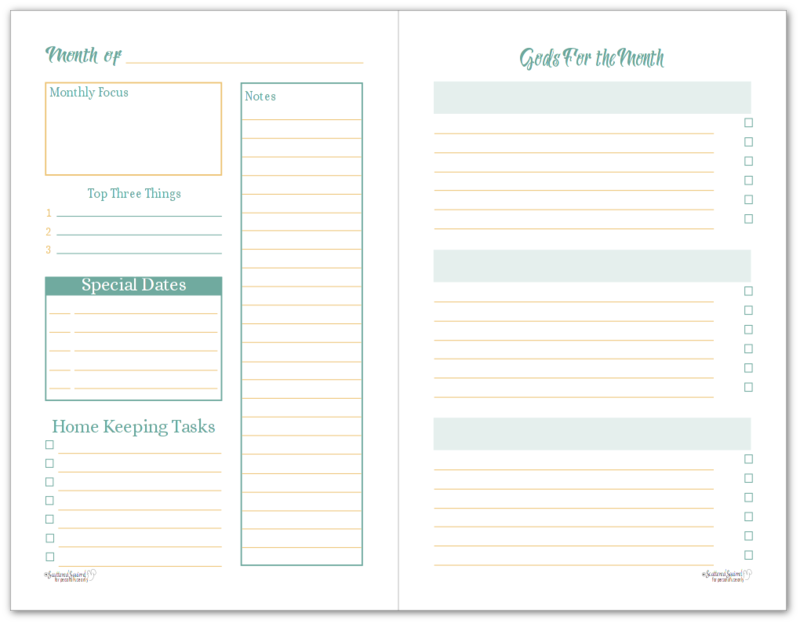 Drop me a line in the comments below and let me know if you think these will be helpful additions to your planner or if you prefer using something else. You are an amazing woman. That’s all I wanted to say. Cheers! Thank you so much! 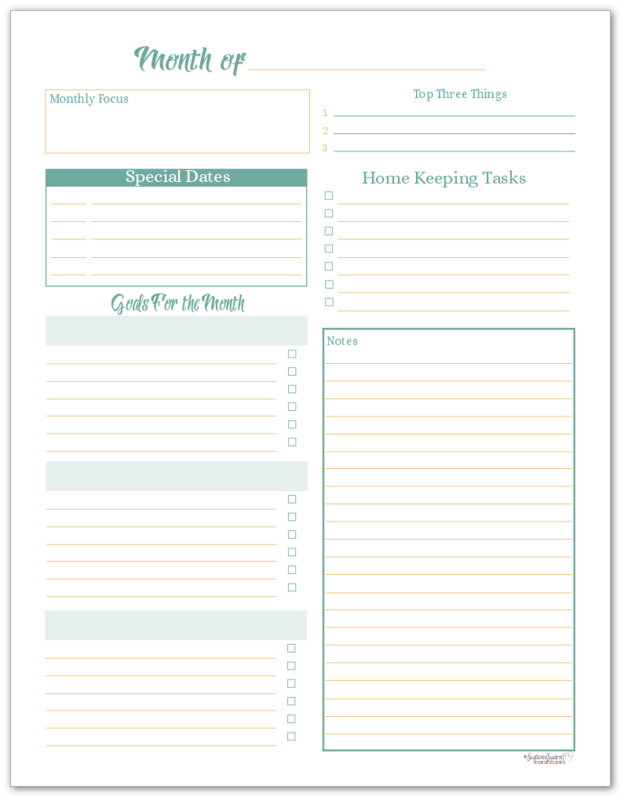 I hope you find some of the printables to be helpful for you! Cheers!! I love, love, love your new 2017 Sunshine printable!. And I love you too! Thanks for all your hard work and for your kind heart in sharing it with us. Aww, thanks so much for your kind words Debbie. You are very welcome. I hope you enjoy them. I love these monthly planners! 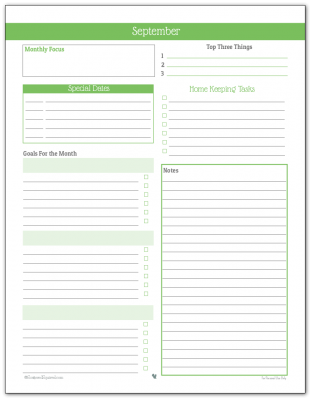 They come in so handy to plan the year rather than nailing it down to a specific date. I have a junior planner so am limited with space. It would help if these were double sided but I know how hard that can be. Thanks for sharing these, I love your site! Hi Anita, I’m working on setting these up to be double-sided print friendly. I’m trying to do that will all the half-page printables. I’ll be slowly updating them so that they’re all two pages per file to make it easier. I know my printer doesn’t like to print copies double-side, which is rather annoying at times. Will there be a monthly planner page in the 2019 colors? to match the 2019 colors?